Click the Blue Star if you want to add duplicates. 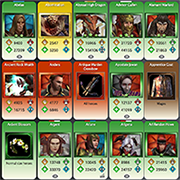 option 1– Use filters to display the custom group of heroes you want. Then Create a new list (+), the group will be automatically saved into it. option 2– Create first a new empty list(+). – All heroes are unselected & name turn white. Using the Lists Selector allow you to display heroes selected in the active list, those with yellow names. Combining with the Filter My List you can display only these. You can also import / export lists for share with friends or manage your lists on different devices. Just Use the Share option to get a shorten-link that you can copy/paste in any browser to load the list. You can also use the Save/restore options to save a text-version of the list in a text-file that you can save and restore later. Cet article a été posté le 26 mai 2016, 18 h 42 min sous la catégorie HODA Codex. Vous pouvez suivre les réponses à cet article via RSS 2.0.